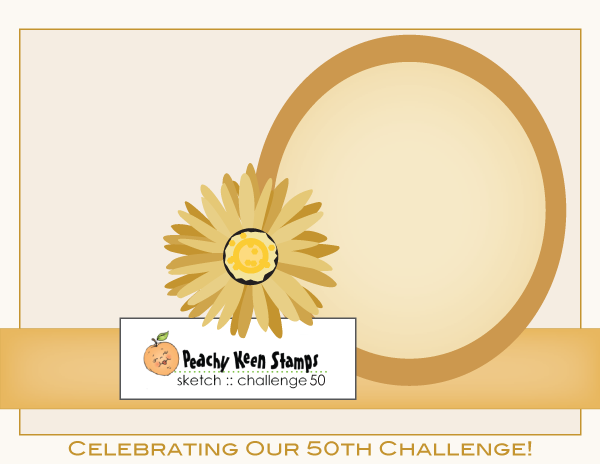 I wanted to enter the Peachy Keen Challenge; it's their 50th one, and I also needed to make a card for my hubby for Easter. So here's the card I made for both reasons. For the challenge, you need to follow the PK sketch and include something metallic. This is a 4.5x6.25 card. I cut the white layer at 4.25x6 and embossed it with Diamond Plate cuttlebug. 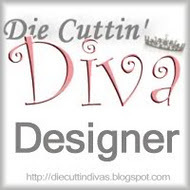 The scalloped circle was cut from Accent Essentials at 3.5 and the bunny face was cut from Doodlecharms at 3.5. I really like this bunny face stamped with the Peachy Keen eyes. I used a metallic brad for the nose and drew in the mouth. Cut the eggs at 1.75 real dial size (not sure why I had to use that feature but if I didn't, they were cutting at 1/2" or less). Patterned paper and then solid paper was used for the shadow of the eggs but it didn't really seem to shadow, or maybe it was so slight, you couldn't tell. Used some Easter ribbon and popped everything up. The stamp was from Michael's $1.00 bin from last year. I really like the inside sentiment (2 of them actually), also from $1.00 bin. Thanks for looking! Super cute. Love that heart nose. Super cute card! I LOVE the bunny!! So CUTE!!! I love your bunny! Thanks for joining the PK challenge! Good luck!